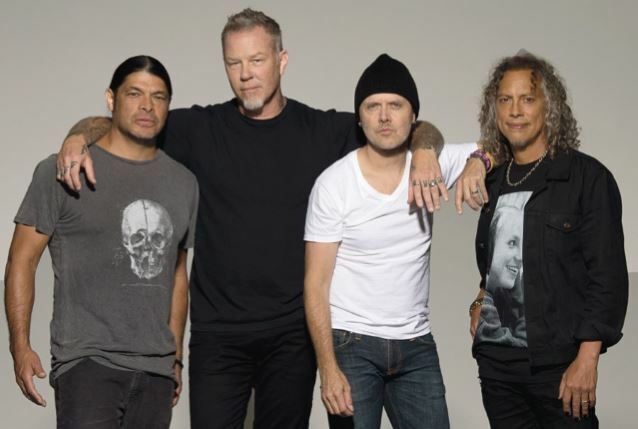 Metallica will perform on CBS-TV’s The Late Show with Stephen Colbert on Monday, May 15. “We’re psyched to be back on the East Coast kicking off the North American leg of the WorldWired tour,” says the group, “and what better way to spend a day off than making a visit to The Late Show With Stephen Colbert? We’ll be hitting the stage at the iconic Ed Sullivan Theater in New York City on Monday, May 15th and we hope you’ll stay up late and tune in! The late night performance lands a day after Metallica play MetLife Stadium in East Rutherford, NJ on May 14, the third date of the tour following stops in Baltimore and Philadelphia, PA.
Metallica will open a series of Pop-Up Stores during the trek, and the group’s New York-area gig also marks the grand opening of the first one in New York City: from May 12-14, fans can access the store at 96 Spring Street to check out various band merchandise. Other cities confirmed to host Pop-Up stores include St. Louis, MO (June 2 – 4), Houston, TX (June 9 – 11), Chicago, IL (June 16 – 18), Atlanta, GA (July 7 – 9), Toronto, ON (July 14 – 16), Los Angeles, CA (July 27 – 29), San Diego, CA (August 4 – 6), and San Francisco, CA (August 11 – 13). Ahead of opening night, Metallica have issued a new live video of the single, “Hardwired”, filmed in locations around the world.